Randy Dean -- The E-mail Sanity Expert! I help people manage their time, e-mail, projects, & people! I'm best known for my programs on Taming the E-mail Beast, Finding an Extra Hour Every Day, Optimizing Your MS Outlook, Time Management Using Gmail/Google, and Smart Phone Success & Terrific Tablets. I get people productive using popular tools! Randy Dean, the “E-mail Sanity Expert” TM, is a professional speaker and expert on time & e-mail management, effective organization, and the related use of technology. 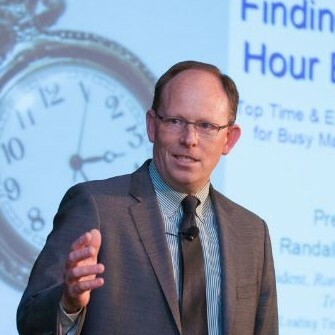 For more than 20 years, Randy has been leading training and speaking programs for major corporate, university, association, and government audiences. Obsessed with time management and personal productivity, he left a successful career as a graduate program admissions director, professional marketer, and manager to become a leading speaker and trainer. The author of the recent Amazon bestseller, Taming the E-mail Beast, he has led programs for thousands of satisfied and inspired students, managers, and professionals on being more productive with their time and life. His highly informative and entertaining speaking and training programs leave audience members with immediately-usable tools, strategies, and skills on how to better manage their time, technology, and information overload following their program experience. Find out more about Randy Dean -- The E-mail Sanity Expert! at http://www.randalldean.com.